Discover a truly remarkable hotel experience here in the heart of the city. Fresh off of a multi-million dollar renovation and brimming with boutique amenities, Le Méridien New Orleans seamlessly blends European heritage with a very modern sense of style, inspiring both relaxation and creativity. You'll find our hotel in a quieter section of New Orleans' vibrant downtown district, just steps away from the legendary French Quarter. Soothingly appointed rooms and suites boast boutique furnishings, lush bedding, and modern technology, as well as in-room dining. Indulge in a swim at our outdoor rooftop pool, and delight in the intriguing flavor combinations at LMNO Restaurant. Or stimulate your imagination with a visit to one of the cultural attractions that surround us; as part of our Unlock Art™ program, we offer complimentary admission to the Contemporary Arts Center New Orleans, the New Orleans Museum of Art (NOMA), and the Ogden. 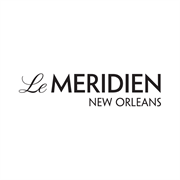 Do you own Le Méridien New Orleans? Due to the unique way that the eBusinessPages Business Directory is structured a Premium + Verified Listing is the most powerful way to get more clients to contact Le Méridien New Orleans. Not only will your listing be more noticeable and more trustworthy, it will also be displayed more prominently in our category (Hotels and Parent Categories) and location (New Orleans, LA and USA Wide) listings. Le Méridien New Orleans will be displayed in your competitor's listings while no ads will be shown in your own listing. Starting at $2.78 for a Premium Verified Listing, there is every reason to give Le Méridien New Orleans the eBusinessPages Premium treatment today.